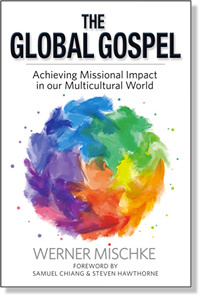 The Global Gospel impacts many of the basics—how we read the Bible, how we preach the gospel, how we understand our mission, how we train leaders, how we collaborate in the global church. The Global Gospel will stretch your understanding of the gospel of Jesus Christ by uncovering a major blind spot in Western theology, namely, honor and shame. The Global Gospel is a call for theological dialog and missional creativity rooted in the ancient paths of Scripture and the relational honor of our King. You and your team will be challenged to reconfigure what you do and expand what you believe is possible in our Lord’s Great Commission. Amazon.com — 1) Kindle version ($9.99) and 2) paperback edition. Paperback, case of 10: $99.90 / $9.99 each, plus shipping. Save $80! The publishing advisor for The Global Gospel has been Dan Wright Publisher Services, Nashville, Tennessee.